When I attended my first U2 concert a little over a year ago, I was startled to discover midway through the concert that I was praying aloud. Three weeks ago, as I again experienced U2 360, this time in Edmonton, I had the same experience of vacillating between a rock concert and a worship service. I’ve been to a lot of concerts, some Christian musicians, most not, but no matter how much I enjoyed them, I don’t think I ever felt like praying out loud – I definitely didn’t do so. FAITH: The band clings to Christian faith, as can be seen in their lyrics, in their music, and in the way they use their music and their fame. I have heard all the arguments about lifestyle, mistakes made, hoarding wealth, and buying into superstardom – to some extent I sympathise with these arguments. I don’t feel any need defend the band’s behaviour, but I think it’s fair to say that they have clung to Christ through the maelstrom of fame. It may be a beleaguered faith, a limping faith, a faulted and pock-marked faith – but it is faith nonetheless. And which of us, honestly, can say that our own faith is smooth and pristine? PREPARATION: U2’s set-lists are carefully crafted. The band never hesitates, never misses a beat – the audience is pulled from song to song through one beautiful transition after another. And these transitions are not just musically smooth, their content adds deeper layers of meaning to surrounding material, and provides fresh perspective on old songs. I don’t have space to dig into the details of set-lists, but after my research I am more convinced than ever that an incredible amount of time and effort goes into the planning of a single U2 concert. The audience is guided carefully from start to finish, and by the end of the concert they are no longer in exactly the same relationship – to each other, to the band, or to the world – as they were when the concert started. To phrase it with a more liberal spreading of cheese: Bono and the band take the crowd on a journey. CONNECTION: I have never seen anyone connect with an audience the way Bono does, and I’m speaking specifically of Bono now (it’s hard to imagine Adam, for example, fully engaging with the crowd). 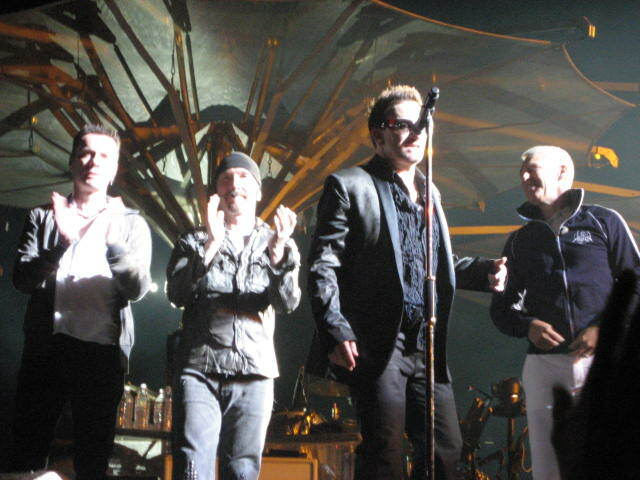 Bono throws himself, heart and soul, into each concert he plays and, for that span of time, he belongs to that crowd. There’s no other way to describe it. I was privileged, for my first two U2 concerts, to be right in the pit, 3-4 people back from the stage, front and center. It was a great location from which to observe the extent of Bono’s relationship with the crowd. He is so connected that he will shift in mid-stride to keep up with the audience. Because of this, he lingers when the crowd needs to linger; he moves on when the crowd is done. He connects personally with individuals in the pit: pointing and waving at people, looking people in the eye, singing to people rather than at them. He connects with the wider audience by playing to the cameras. He is constantly finding unique ways to break the barrier between stage and audience: swinging out over the crowd, throwing things into the pit, using bridges and 360 stages, and pulling people up on stage… (it embarrasses me to say this, but his connection to the crowd is such that I am personally convinced that he winked at me during the concert on June 1st). 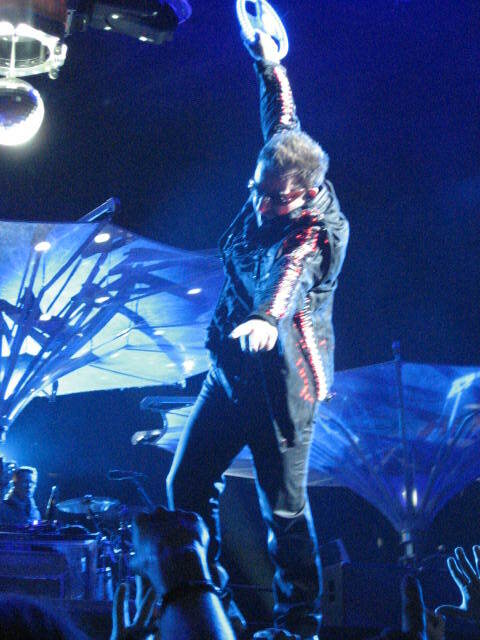 By connecting intimately with his audience, Bono ensures that they not only watch the concert, but feel that they are participants. ATTENTIVENESS: Bono is not only connected to the crowd, he seems extraordinarily attentive to the Spirit during his concerts. I know there is no way I can establish this as fact, beyond a shadow of a doubt, but here are my observations. At times, during a concert, Bono will simply stand with his eyes closed, sometimes with his arms in the air, sometimes with his lips moving. Almost inevitably, this signals a change. The band will continue playing the same chord progression and, after a brief while, Bono begins to sing something different, repeating a phrase of an earlier song, or one he just finished, or the upcoming song, or something else entirely. He sings in a slightly irregular rhythm, or changes the melody just slightly. The crowd quiets, and becomes more attentive. And then something shifts. I have no other words for it, and cannot describe it more concretely than that. Sorry. I can merely say that I am convinced that, in those moments, Bono is seeking and receiving the guidance of the Holy Spirit. RESPONSE: Whether or not you like U2’s blatant promotion of social justice (some would say bullying toward), you have to admit that the band puts together a pretty strong call to action. Every audience at a U2 show expects and receives a great experience. Every audience leaves feeling pumped up. And absolutely every audience knows what they are expected to go out and do after the concert. Make the world a better place. Give the future a big kiss. Get involved. So… why do these five elements make U2 one of the best worship bands of our time? FAITH every worship leader/band should have. That’s a given. Good PREPARATION, is essential (read my rant on the topic). U2’s careful attention to transitions helps to guide the congregation from one song to another, from one part of the service to another. 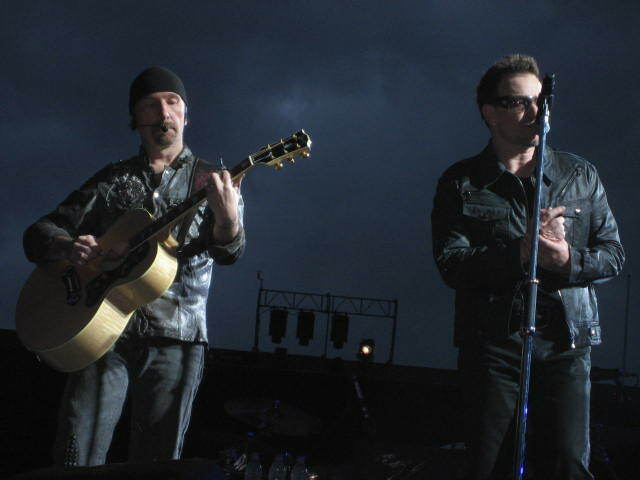 Bono’s CONNECTION with the congregation ensures that congregation members are involved as participants rather than merely as audience. By being ATTENTIVE to the Spirit as he leads, Bono is able not only to shift with the congregation, but to move them according to the Spirit. But what I’m most impressed with, and what I feel is most lacking in our worship leading – what U2 does successfully over, and over, and over again – is to lead their audience in a RESPONSE. They consistently answer, strongly and clearly, the question: now what? All too often in our worship services we are content to sing one more song of praise and then “dismiss” the congregation – as if school is over for the day. Even school children get homework. What is the point of a weekly worship service? To encourage one another, yes. To hear the word of God, certainly. To teach and be taught, no doubt. But what we so often miss is that a worship service should send people out. Should call people to do something. Not every person at a U2 concert comes away with a deeper love for Father, Son, and Holy Spirit. Some people there will inevitably be worshiping other gods (perhaps Bono or the band; perhaps the god of social action or left-wing politics). But every single person will leave knowing the answer to the question: “what now?” How many people will leave your service this week knowing what difference the word of God, the people of God, the Spirit of God, the three-personed God should make in their daily lives? How many people will leave your service this week having been called to love God and neighbour with the choices they make? How many people will leave asking “now what?” and how many will have the answer, and therefore be equipped to fulfill God’s mission in the world? Next Post → What’s Wrong with the Temple? —U2 frontman Bono, discussing Christian and secular music with a small group of reporters after the National Prayer Breakfast on Thursday (Feb. 2). I don’t know that I would concur that Bono is actively seeking guidance from the Holy Spirit during a concert, but he is certainly as engaged in the moment as he asks of us. Other than that, totally agreed with everything here. “The band clings to Christian faith, as can be seen in their lyrics, in their music…” What about U2’s music (not lyrics) can be delegated “Christian” as oppossed to similar music by non-Christ followers? As far as “music” absent from lyrics……. when The Edge plays those ringing notes they lift my spirit. Hard to describe but no other word comes to mind except ‘joy”. he’s captured that. I’ve thought similar for quite some time. Though I’ve not been at an actual concert. Regarding U2’s concern for social Justice: We know that them Bible makes no connection between worship and social justice? I was affected in a similar way by the recent show in Seattle (a few days later than the Edmonton show), my first U2 concert. At one point during a moment where the chord progression continued, as described above, Bono seemed to wait on the music for a few moments, then lifted up his arms and sang in a quieter tone, “I’m just dancing before you, Lord…” the music continued, and then shifted and moved on, but I felt the same thing that you talked about, that there’s a sense of waiting on the Spirit that is similar to what I understand from my experience in church and worship. Again, I don’t know if he would describe or intend it that way, but the lyrics of many songs intentionally refer to Biblical events, people, phrases, concepts, and and language. Hey Stacey, I enjoyed that. I’m a believer too. Wondering how many other worship leaders have so many non-Christians in their ‘service’. Lament a huge part of their song base with a ‘why?’ song on most albums, which maybe connects more with real life. Also lots of prophetic stuff, directed into church. Cud go on and on. Delighted to see an Irish husband is having an impact! I have seen U2 once and it was spectacular. I think it was worship but much of it was of U2 rather than of Jesus. However, there was certainly ‘something going on’ which is a suitable vague agreement with some of your challenging and excellent thoughts. As a worshipper, you might enjoy ‘Now to him’ by Simon Ponsonby and Neil Bennetts which our worship team have been really blessed by. Keep at the blogging. Thank you David. I certainly agree that not all of U2’s pyrotechnics result (or are even aimed at) worship of Jesus. I do think, however, that there are some interesting parallels to be drawn to those of us who do seek to lead others in worship of Christ. Things we could do better. Things we might need to think about.